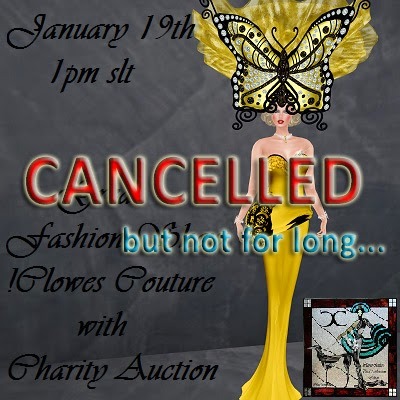 Due to a boycott by a griefer there will be NO more fashion show and charity auctions at Angel Manor. Things like this are very unfortunate for those who try to come together and help others. We become victims of attacks and grief by people who use envy, jealousy and slander against us. They think they have won over those that are trying to do good but not for long. Unfortunately this is Second Life and it contains some nests of crows and snakes. You just have to know how to control the pests. I am officially announcing that we are cancelling the !Clowes Couture fashion show on January 19th and everything will be relocated and rescheduled for February 28th. Meanwhile, big news is we will move forward, head held high and my precious name and my reputation is not in the least affected by this griefing. For those who don't know, Belle Roussel's Facebook account was disabled by Carla Chiari Clowes, who reported it, as revenge for exposing the nonpermissive resale of Chop Zuey jewels. And how do we know? "Justice is done." from Carla's own FB account. Idiot Anonymous, for Those Who do not know ?? Belle Roussel's Facebook account was disabled by Carla Chiari Clowes, who reported it, Because it is a slanderous and I have given all the evidence to Facebook and Linden Lab. And if the account has been permanently deleted from facebook (and warned by Linden Lab that if it happens again will close his account too and his ID, as he declared in herself to a few close friends that have reported to me and Linden itself has confirmed), it means that he was wrong and that he has committed a wrongful act. Before she was my business partner, she sold it to me for almost $ 25,000 L of jewelry for the show. I decided I then went to an auction charitable. One went to a Miss VW and another to a journalist my friend. Are mine, paid, if I want to gift them also. But because she did NOT want that the jewels go charitable auction? This is disgusting! It seems simple and linear as also explained the Linden. I am good in all the regulations. Because when I said to her: "I give them back to you and I do not want to know anything, give me back my money!" has not accepted? Not accepted for money, for economic reasons, she just wanted to destroy his former partner, nothing more. It was destroyed by itself, really made a poor showing in all of this, people judged her for having raised a fuss, but it was enough take the jewels and return the money. I am completely INNOCENT. I've been slandered and she punished. This is a fact.